The popular game engine GameMaker Studio has only been available for Windows since its first release in 1999, but that’s about to change. GameMaker Studio 2 is entering open beta testing for Mac and interested parties can sign-up now. While you’re looking to make indie games, check out our list of some of the best. YoYo Games, producers of GameMaker Studio 2 stated that the Mac OS version of the engine is on par with the Windows version. Mac users will have access to the same powerful yet simple drag-and-drop system. This allows those without advanced programming experience to create games using an intuitive interface. 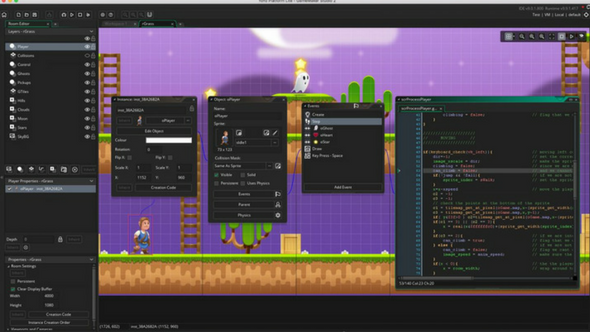 For developers that have more experience under their belts, the Mac OS version of GameMaker Studio 2 has the same programming language and tools. To sign up for the open beta of GameMaker Studio 2 for Mac and more news on development, head over to the official website.